What does success mean for a tech startup? We have all heard success stories of tech startups from the silicon valley. These stories have inspired many to go down the same path only to uncover the fact that it’s not as easy as it sounds. That does not mean that it’s not possible to succeed if you have found all the pieces of the puzzle and know how to assemble them. Success for a tech startup like any other business can be defined in terms of profitability and scalability. If your business is able to operate and stay profitable at the same time then it can sustain. If your business can be scaled to increase profits then it can be successful. There are several factors that must be considered to evaluate a business’ viability. Market size for example is one such factor that puts a limit on how successful you can be, irrespective of how attractive your value proposition is. A tech startup is different from other businesses in the way it interacts with its customers where Internet is the medium and there is almost no direct human interaction. This means that you have to put a lot of upfront work to create your business process because of the limiting factors including personal interaction. Click here to learn more about these three steps. 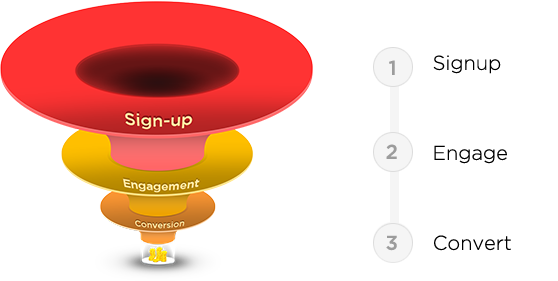 These three steps make up the sales funnel of any online business. Throughout this guide we will cover the activities that are essential to draw leads to your business and convert them into paying customers. This model applies to any kind of online digital business irrespective of the products and services it offers.